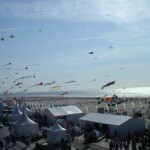 Let’s start out with some background on how I came to attend the World Sport Kite Championships in Berck this year. I am the middle woman of MVM. 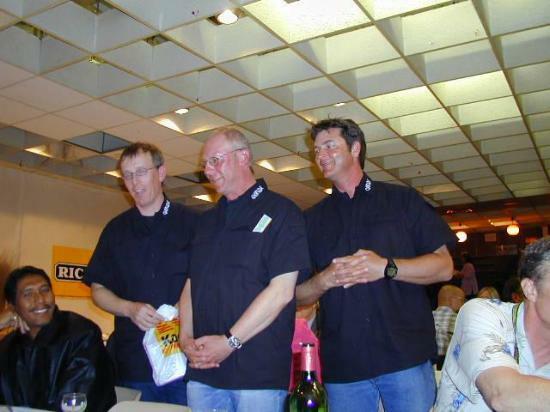 We were the only all female Master’s team at our National Convention and also in France. We came into being when Marcia Cannon asked Mary Bos and I if we were interested in flying with her. Her husband, Jerry Cannon, had decided to fly on Team Cutting Edge with Jim Barber and Rick Wolcott. She figured since he would be busy with the team, now would be a good time for her to learn to fly team. Our name comes from who we are, Marcia, Vicki and Mary. You can find us flying our Shivas on the beaches of Ocean Shores, Washington. 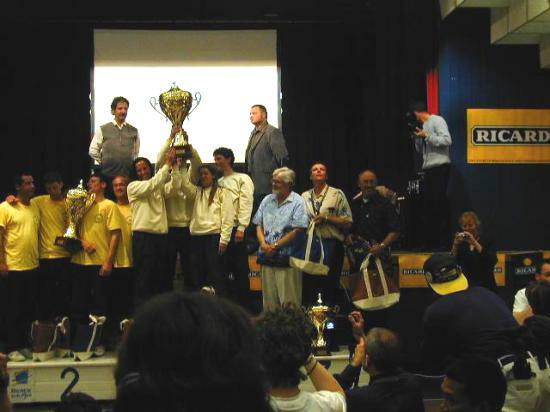 After a winter of learning to fly together and learning a ballet routine, we finished in first place in our region for the 2003 competition season. We were invited along with Team Cutting Edge to the National Convention in Dayton, Ohio where we came in 5th place overall. 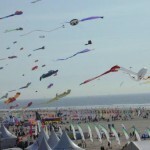 As many of you know, only to the top three teams were invited to the World Sport Kite Championship. After Nationals MVM decided to take a bit of the break through the holidays. We received an email in early January asking if we were interested in accepting an invite to Berck. Turned out that Chicago Fire and Dogs Playing Cards were not going to attend. I was really excited to hear that we would be able to go. The only reason I hesitated was that my husband and daughter would not be able to go with me. What a great opportunity for a first year team. We met as a team to talk and think about accepting. It took us only a weekend to decide to go. Once the decision was made I felt a bit intimidated. Imagine being a first year team and having the opportunity to compete with the best teams in the world. 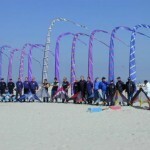 Our goal this year was aimed more at learning to fly together and not finishing last at Nationals. Fortunately, we found out with plenty of time for us to prepare, get passports for those of us that needed them and to practice, and practice some more. We flew all winter in whatever conditions Mother Nature dealt us. Rain, hail, even the occasional sunny day. Team Cutting Edge and Air Zone Flight Team were going to make out the rest of the US teams. 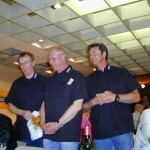 Team Cutting Edge is made up of Jim Barber, Rick Wolcott and Jerry Cannon. 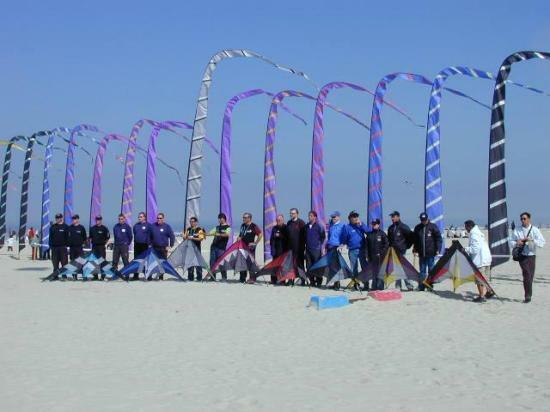 They got together as team specifically to go to the World Sport Kite Championships. Jim and Rick had flown together on Visual Impact previously and had missed out on going to the event that was to be held in Malaysia. Air Zone is made up of Aaron Champie, Wayne Fu, Darrin Skinner, and Ulysses Villanueva. They were also a first year team. As a former member of Team Tsunami, Darrin Skinner has a number of years of team experience. This was the first year of team for the rest of the members. MVM and Cutting Edge took off from SeaTac airport in the Seattle area on the morning of April 15th and spent the whole day traveling. We were lucky enough to have about a four hour lay over in Philadelphia since there was no food service on the first leg of our flight we needed the time to eat. Caught the plane to Paris for another 8 hours or so in the air. Tried to catch some sleep on the plane but that didn’t work out too well. You know how it is, no room to stretch your legs and you just can’t quite get comfortable enough. We landed in Paris on the morning of April 16th. I was so glad to finally be back on solid ground. The first two things I wanted to do was eat and sleep but that all had to wait. We waited about an hour for our luggage to finally get to the baggage claim area. It gave us some time to stretch our legs before getting on the bus for another three hours of traveling. We all met up with David Gomberg, David Hansen, Air Zone Flight Team and some of the other US invitees just outside of customs. 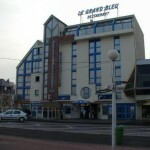 Once we are all accounted for we had to catch the bus to Berck. We passed through some beautiful country while on the bus. Having spent the previous day traveling without much sleep it was the perfect opportunity for a nap. I think there were a few of us who had that idea. 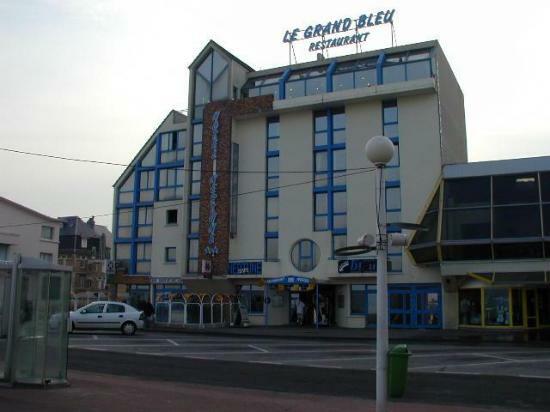 Our first stop in Berck was the tourism office where we received our hotel assignment and food vouchers. This took some time, since they needed to know our flight time out so they could book the buses for us to leave. Meanwhile, the tour bus is parked blocking the street. The streets in Berck are narrow and there was no way anyone stuck behind the bus was going to get around it. I hope that we did not take too much time in the tourism office. The people stuck behind the bus were getting impatient. The bus driver was even sympathetic. He played air violin to accompany the chorus of car horns. 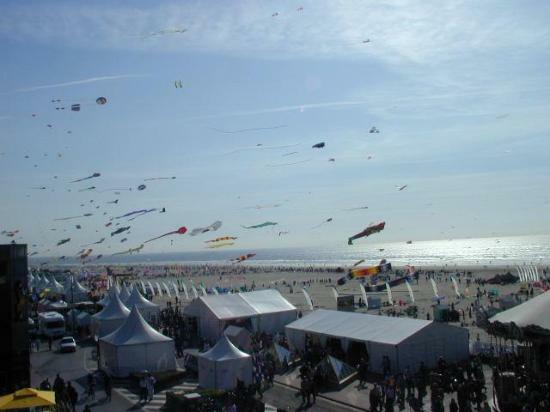 Berck is a beautiful city located on the English Channel in Northern France. When the tide went out there seemed to be miles of beach. 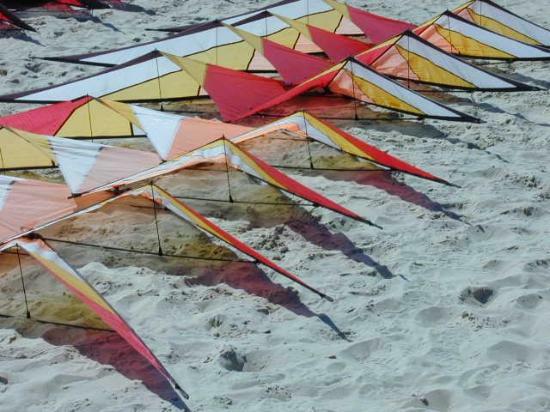 Most days at low tide you would see land sailors, buggiers, land boarders and many other people enjoying the beach with kites of all types. 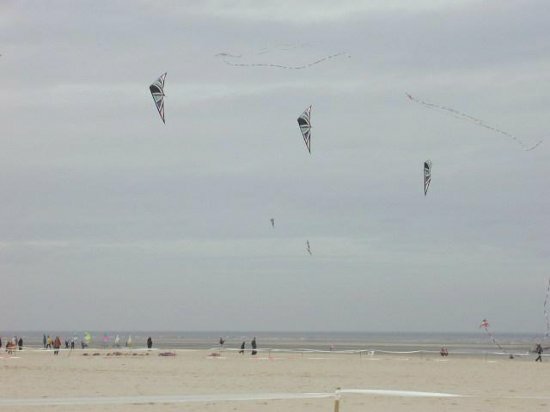 When the tide came up, there were times when it was difficult to find room for one more kite in the air, let alone three for team practice. After a good nights sleep we all met at the tent for a welcoming meeting and lunch. 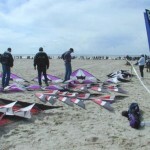 The teams were all assigned a Cabana to store our kites in while we weren’t flying. 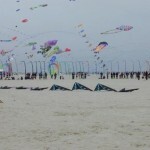 It was great to be able to leave our kites on the beach. 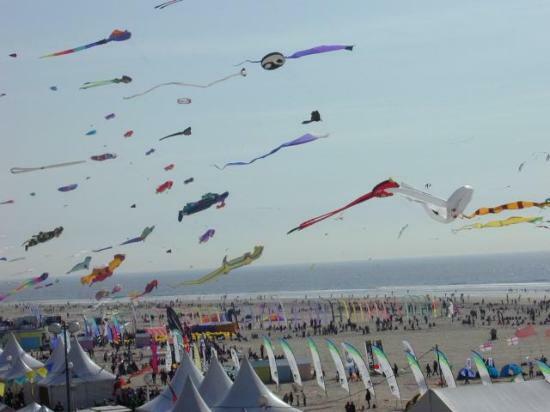 Getting our kite bags and gear through the crowds would have been tough. 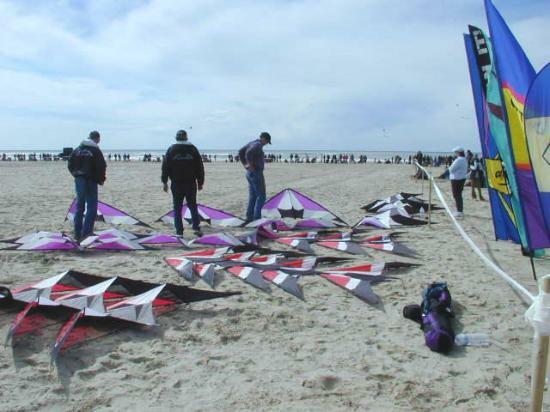 The beach was crowded when we finally got out there to tune kites and get ready for three days of demos. 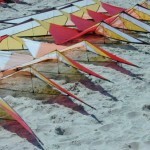 After walking for a bit we found a spot with just enough room for three kites. 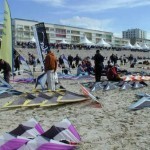 We still had to share space with other teams, single line kites and all the people on the beach. Demos did not start until 2:30 in the afternoon, which gave us time to practice in the morning when the beach wasn’t as crowded, and to get ready for the afternoon. There isn’t anything like walking onto the field and seeing the people crowded along the esplanade and around the field. 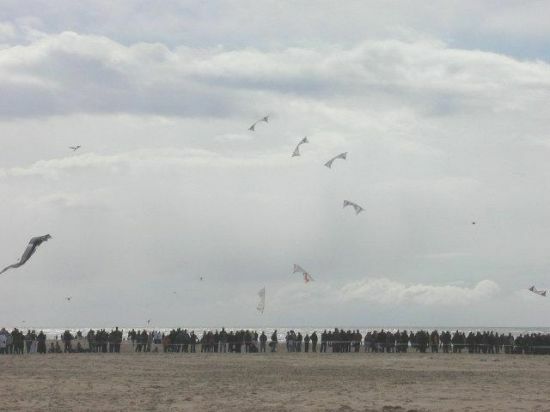 All I could think about and see while I was setting up my kite was how many people there were. I don’t remember being that nervous the first time I competed. Once our music started the crowd disappeared. I’m glad that we had demos the first day and not competition. It gave us a chance to settle into the crowd. The thing that impressed me most about the other teams was how tight their spacing was. They were so close together that there was not much room for error. 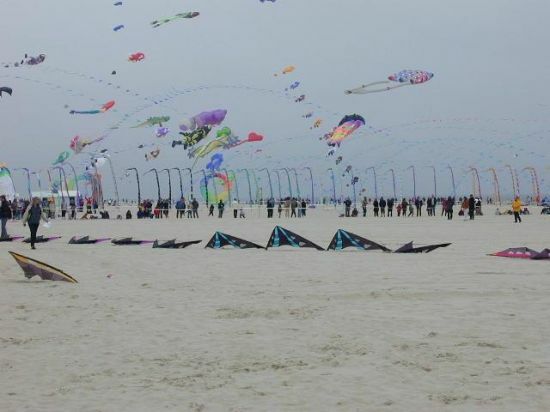 If something went wrong with one kite the one behind it or in front of it probably would have gone down too. This made for some really impressive shutters, especially when the kites come in to the center and exited back out with a half axle. History has led most of us to believe that a World competition always has more wind than any one wants to fly in. 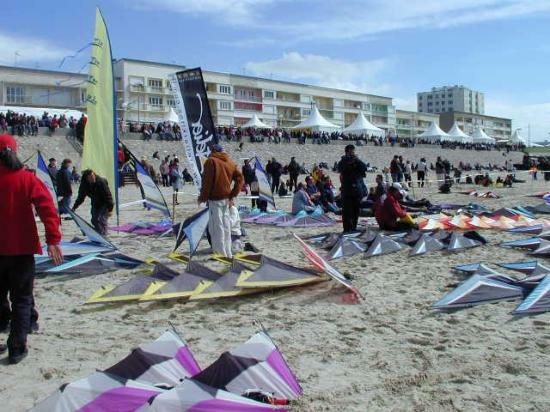 Even the history of this competition in Berck has dictated that there would be wind and that temps would be cool. This year things were a bit different. 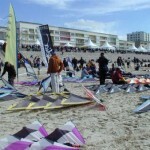 We had light winds and sunny warm weather for most of the competition. We all met early in the VIP tent for the pilots meeting. The first precision figure was to be flown at 9:00 am, and with 17 teams, we had to be on time and keep things moving along. Air Zone would be the first team to fly precision and the last to fly ballet in the afternoon. We saw all levels of flying today. The wind didn’t cooperate with some of us, while others seemed to deal with it well. I remember waiting for our turn to fly and seeing the single lines on the next field begin to drop out of the sky. Not usually a good sign. After a couple of demos that did not go well for us, we were just about ready to try anything. One of my teammates had a clothing malfunction before we flew our precision. She inadvertently grabbed her tee shirt while she was taking her sweatshirt off to mark the field. I’m not sure that was the help we needed that day. We were really impressed by the French, German and Japanese teams. Team Cutting Edge was also in the mix. They flew great. We were really happy to see them fly well. Day two began with more sun. Later in the afternoon it warmed up enough that I was wishing I had packed more shorts. We began the day early again with the first figure to be flown at about 9 am. We flew the next three figures on the list. 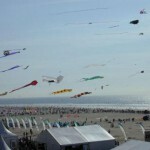 The winds were light enough that it was not a consideration in the choice of figures for that day. Precision went smoothly for us today. We flew the best figures I think we have ever flown. We made it through our freestyle routine. Some of the teams that flew well the first day had a few problems this day. The Scratch Bunnies had the clothing malfunction this time. I believe one of the members split his pants. The wind was so light today that there was a 1-hour wind delay in the afternoon while Neo was on the field. MVM was waiting in the pits. We chose to fly on 100 feet of 90-pound for ballet. Short line for team, I know, it was our only other option to get through our routine. We received our highest scores of the week in both precision and ballet. After a few days of hearing all the teams’ music many of us commenting on having another teams’ music stuck in our heads. Day three did not start as early as the rest of the week. Since we had been finishing up earlier than expected, our start time was pushed back a half-hour. The winds were still light, but heavier than the earlier days. A few things stand out in my mind about this day. MVM hit our refuel in our ballet for the first time in competition. Hitting the one in our precision was easier for us, since timing was not as much of an issue for it. Team Cutting Edge flew great again. Nailed their refueled landing in their precision routine. Marcia and I watched Element Air from right down wind of where they were flying. It was an incredible thing to watch. Two of them land while the other two fly a sequence and then come and pick the other two up into a refuel right off the ground. Whoa, that was awesome to see. They seemed to hit everything right that time through. Finally all the pressure of competition is gone. I was glad to have it done. Now we could all relax and decompress a bit. We enjoyed getting to know the members of Kamikaze, Neo and Windy Magic. We were all usually down at the cabanas around the same time in the morning. 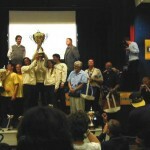 Friday night was the awards banquet. We were all anxious to see who was in the top five. The score sheets had been handed out each evening so those not in the top five had a pretty good idea of their final standing. I had Element Air and Tame Bird in the top two slots and Cutting Edge in third. Friday there were more demos and many single line kites in the air. There was a final pilots meeting to let us know about when the banquet was and to let us know that the judges would be available if we wanted a detailed break down of our scores. I needed some time to myself so I spent the day shopping and wandering around town. Demos were going on throughout the day, as well as many single lines being flown. We were happy to see Cutting Edge do so well. Knowing how bummed Jim and Rick were when Malaysia was canceled, this was great for them. They flew well all week and worked really hard this last year and a half, and accomplished the top finish for a US team in many years. The crowds were even bigger Saturday and Sunday than they were the previous week. The sun was shining bright and the winds were blowing. The sky was full of single lines. 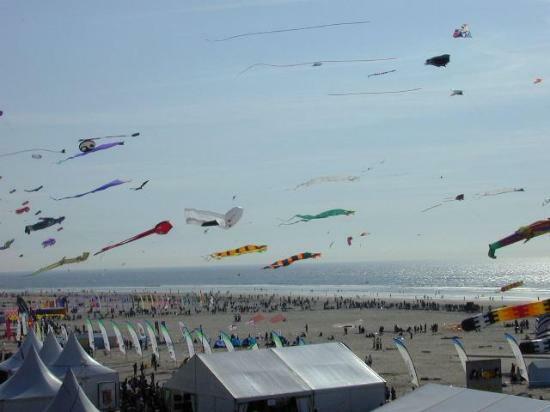 I’m not sure I’ve ever seen so many kites in the sky at once. It was incredible. 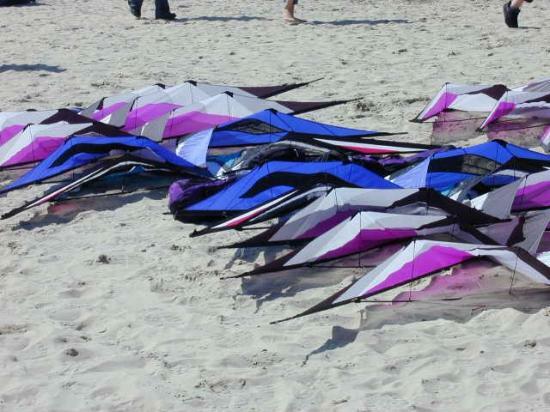 We spent both days on the beach flying demos and saying goodbye to our new friends. The mega flys were by country with their team demos following. Even though the three US teams had talked about what we were going to do, we still got off track on the field. We could not hear the calls over the speakers that were right behind us. I think part of the time a couple of us were off to one side, keeping our kites out of the way. After all the demos were done Sunday, there was one last mega team. 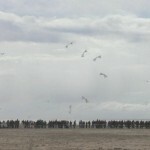 I believe there were 33 kites in the air. That was crazy. 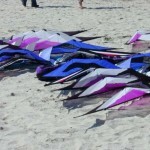 I have never flown with so many kites that close at one time. We were towards the end of the line and somewhere in the middle there was a crash. Somehow we managed to stay in the air, even if it took a bit of time to get back in with everyone else. 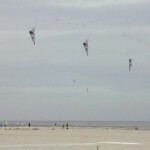 There were also demos from quad-line teams (Flic, The Decorators, The Flying Squad), Ray Bethell, a team of power kites, and several other groups performed for the crowds. Ray Bethell, as always, put on a great show. Monday we had a 3:30 am wake up call, since we had to catch the bus to the airport at 4:30 am. Our flight did not leave Paris until 1:00 pm. What a long day this was. We had to transfer planes again in Philadelphia, but we only had an hour in between flights. Waited in long lines at customs, hoping we would make our connection. We had to track down our luggage and transfer it, and then went through security again and just made it to our gate towards the end of boarding. When we finally arrived at SeaTac we learned that our luggage missed the connection. Apparently when you go through customs, your luggage is supposed to go through security twice before getting back on the plane. It is a good thing that it happened on the way home and not on the way there. The airline sent our luggage to Ocean Shores where it arrived the next day. We were happy to have had the opportunity to go and compete with the best in the world and would like to thank everyone who made the event run smoothly. An extra THANKS goes to the judges, field directors and our scorekeeper. 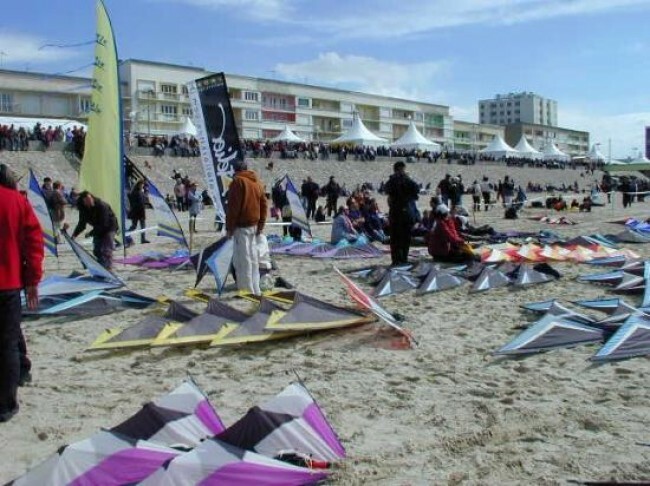 This entry was posted in 2004, Competition, Dual Line, Events / Festivals, General Topics, Issue 36 (May/Jun), KL Archive, Reports and tagged berck, competition, France, sport kites, team.